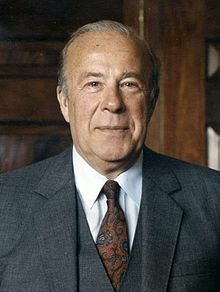 George Pratt Shultz (born December 13, 1920) is an American politician, economist, statesman, and businessman. He was the United States Secretary of Labor from 1969 to 1970, as the U.S. Secretary of the Treasury from 1972 to 1974, and as the U.S. Secretary of State from 1982 to 1989. Shultz was born on December 13, 1920 in New York City, New York and studied at Princeton University and at Massachusetts Institute of Technology. He has been married to Helena O'Brien from 1946 until her death in 1995. He is now married Charlotte Mailliard since 1997. Shultz has five children. George P. Shultz. Hoover Institution, Stanford University. 2008. http://www-hoover.stanford.edu/bios/shultz.html. . This page was last changed on 22 January 2019, at 04:37.